In 2015 the V-8 engine was subbed out to the feature V-6 engine which is a twin-turbocharged offering, 3.5-liters, direct injection EcoBoost producing 365 horsepower, 420 lb.-ft. torque and towing capacity of 9,200 pounds which checks in as the best in its class. The transmission on all trim levels is the Six-speed SelectShift Automatic. The V-6 actually fits way better with the vehicle delivering more than enough power obtaining 0 to 60 in less than 6 seconds. Fuel efficiency is 16 miles per gallon city and 22 miles per gallon highway. Throughout the entire model lineup, you can upgrade to four-wheel drive from the rear wheel drive base model. New this year is an extremely useful dampening technology that allows the operator to select from three available driving modes normal, comfort and sport. There are 46 sensors detecting steering, body and braking and can adjust dampening in split seconds. It also reads the type of road the vehicle is operating on, the weight of the vehicle and steering patterns and reacts to ensure a comfortable ride. There is also a redesigned voice control system called the SYNC 3 including a touch screen with pinch and zoom capability. The SYNC 3 controls entertainment and communications and has become highly responsive and very useful. This system is located right in the center of the dashboard area surrounded by other cabins controls with a woodgrain finish gives a real fresh look. The interior is spacious including more leg space and knee room in the first two rows. The Expedition has a third row but also a great deal of space for carrying cargo. The Expedition has a great powerized tailgate that helps in loading and unloading everything from sports equipment to furniture. The entry level XLT includes power adjusting pedals, power locks, doors and mirrors, climate control, Bluetooth, USB port and much more. The Limited builds off of this with power folding third row seat, remote start, SYNC 3, front parking sensors and much more. The King Ranch has an interior of untreated leather, power tail gate, 20-inch wheels, many add-ons and much more. The Platinum has basically everything available that Ford incorporates into their SUVs and additional options include a DVD system, second row bucket seats and a different leather interior. 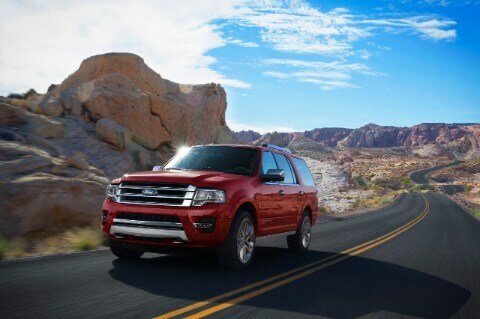 Can you help me finance my 2016 Ford Expedition? New this year is a change in the roof support pillars allowing for more glass and better overall visibility than many competitors. There is also available blind spot monitoring systems, programmable MyKey systems which allows parents to program in a speed limiter, speeding alert chimes and seatbelt reminders. Also coming standard is Trailer Sway Control with the ability to use precise braking and engine torque reduction to bring trailer and vehicle under control in a better fashion. There are also six airbags, rearview camera, hands-free technology and SOS Post-Crash Alert. 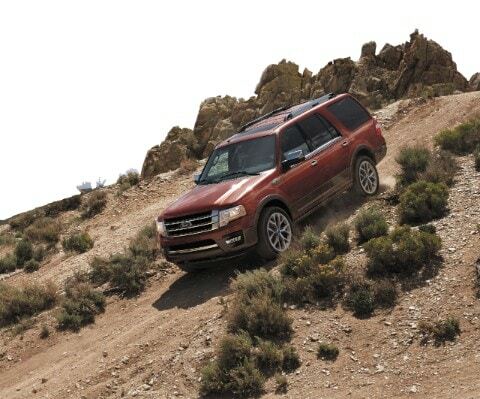 The National Highway Traffic Safety Administration gives the Expedition five stars overall.